Plants annual; erect or decumbent, cespitose or spreading, rooting from the lower cauline nodes. Culms 10-70 cm; lower nodes glabrous or hispid, hairs appressed; upper nodes glabrous. Sheaths glabrous; ligules absent, ligule region frequently brown-purple; blades 8-22 cm long, 3-6(10) mm wide, mostly glabrous, sometimes hispid, hairs papillose-based on or near the margins. Panicles 2-12 cm, erect, rachises glabrous or sparsely hispid; primary branches 5-10, 0.7-2(4) cm, erect to ascending, spikelike, somewhat distant, without secondary branches, axes glabrous or sparsely hispid, hairs 1.5-2.5 mm, papillose-based. Spikelets 2-3 mm, disarticulating at maturity, pubescent to hispid, hairs usually not papillose-based, tips acute to cuspidate. Lower glumes about 1/2 as long as the spikelets; upper glumes about as long as the spikelets; lower florets usually sterile, occasionally staminate; lower lemmas unawned, similar to the upper glumes; lower paleas subequal to the lemmas; upper lemmas 2.6-2.9 mm, not or scarcely exceeding the upper glumes, elliptic, coriaceous portion rounded distally, passing abruptly into a sharply differentiated, membranous, soon-withering tip; anthers 0.7-0.8 mm. Caryopses 1.2-1.6 mm, whitish; embryos 63-83% as long as the caryopses. 2n = 54. Echinochloa colona is widespread in tropical and subtropical regions. 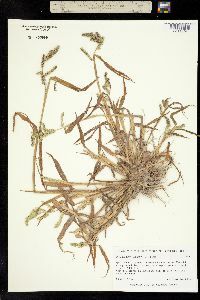 It is adventive and weedy in North America, growing in low-lying, damp to wet, disturbed areas, including rice fields. The unbranched, rather widely-spaced panicle branches make this one of the easier species of Echinochloa to recognize. Annuals, Aquatic, leaves emergent, Terrestrial, not aquatic, Stems nodes swollen or brittle, Stems erect or ascending, Stems geniculate, decumbent, or lax, sometimes rooting at nodes, Stems caespitose, tufted, or clustered, Stems terete, round in cross section, or polygonal, Stem internodes solid or spongy, Stem internodes hollow, Stems with inflorescence less than 1 m tall, Stems, culms, or scapes exceeding basal leaves, Leaves mostly cauline, Leaves conspicuously 2-ranked, distichous, Leaves sheathing at base, Leaf sheath mostly open, or loose, Leaf sheath smooth, glabrous, Leaf sheath and blade diffe rentiated, Leaf blades linear, Leaf blades 2-10 mm wide, Leaf blades mostly flat, Leaf blade with prominently raised or widened midvein, Leaf blades mostly glabrous, Inflorescence terminal, Inflorescence a contracted panicle, narrowly paniculate, branches appressed or ascending, Inflorescence solitary, with 1 spike, fascicle, glomerule, head, or cluster per stem or culm, Inflorescence a panicle with narrowly racemose or spicate branches, Inflorescence with 2-10 branches, Inflorescence branches more than 10 to numerous, Rachis angular, Flowers bisexual, Spikelets sessile or subsessile, Spikelets dorsally compressed or terete, Spikelet less than 3 mm wide, Spikelets with 1 fertile floret, Spikelets with 2 florets, Spikelet with 1 fertile floret and 1-2 sterile florets, Spikelets paired at rachis nodes, Spikelets all alike and fertille, Spikelets in paired units, 1 sessile, 1 pedicellate, Spikelets bisexual, Spikelets disarticulating below the glumes, Spikelets secund, in rows on one side of rachis, Rachilla or pedicel glabrous, Glumes present, empty bracts, Glumes 2 clearly present, Glumes distinctly unequal, Glumes shorter than adjacent lemma, Glumes equal to or longer than adjacent lemma, Glumes awned, awn 1-5 mm or longer, Glumes keeled or winged, Glume surface hairy, villous or pilose, Glumes 4-7 nerved, Lemma coriaceous, firmer or thicker in texture than the glumes, Lemma becoming indurate, enclosing palea and caryopsis, Lemma 5-7 nerved, Lemma glabrous, Lemma apex acute or acuminate, Lemma awnless, Lemma margins inrolled, tightly covering palea and caryopsis, Lemma straight, Palea present, well developed, Palea longer than lemma, Palea 2 nerved or 2 keeled, Stamens 3, Styles 2-fid, deeply 2-branched, Stigmas 2, Fruit - caryopsis. Annual herb, spreading or tufted 10 cm - 0.7 m tall Leaves: alternate, two-ranked. Sheaths open, compressed. Ligules absent (often brownish purple in this area). Blades 8 - 22 cm long, 3 - 10 mm wide, usually over ten times longer than wide, linear to lance-shaped, flat, sometimes hairy, parallel-veined, with a prominent midrib. 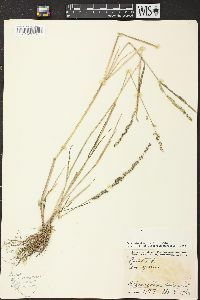 Inflorescence: an upright, terminal arrangement of spikelets (panicle), 2 - 12 cm long, with an elongate and sometimes sparsely hairy axis. 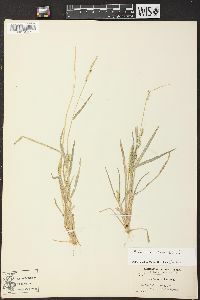 Primary branches five to ten, upright to ascending, 0.5 - 4 cm long, spike-like, with sometimes sparsely hairy axes (hairs 1.5 - 2.5 mm long and bumpy-based). Secondary branches lacking. Fruit: a caryopsis, indehiscent, enclosed within the persistent lemma and palea, whitish, 1 - 1.5 mm long. Culm: upright or decumbent, 10 cm - 0.7 m long, round in cross-section, rooting at the lower stem nodes. Lower nodes sometimes appressed-hairy. Spikelets: densely crowded on angular branches, 2 - 3 mm long, flat on one side and convex on the other (plano-convex), pointed to toothed at the apex, hairy. Florets: two per spikelet. Lower florets usually sterile, sometimes male. Upper florets bisexual, compressed dorsally. Anthers three. Stigmas red. 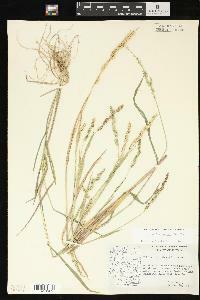 Glumes:: Lower glumes about half as long as spikelets, membranous. 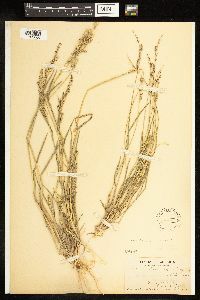 Upper glumes about equal to spikelets, membranous. Lemmas:: Lower lemmas similar to upper glumes in texture and size. Upper lemmas 2.5 - 3 mm long, scarcely (if at all) exceeding upper glumes, elliptic, rounded dorsally, leather-like. Paleas:: Lower paleas nearly equal to the lemmas. Habitat and ecology: Introduced from the Old World Tropics. Rare in the Chicago Region, and known only from Cook County, Illinois. Several colonies persist in downtown Chicago, where they can be found growing in turf, parkways, and along building edges. Etymology: Echinochloa comes from the Greek words echinos, meaning hedgehog, and chloa, meaning grass, referring to the bristly spikelets of some species. Colona may be a contraction of colonorum, meaning husbandmen. Culms weak, freely branched, 1-7 dm; lvs glabrous, the blades 2-6(-9) mm wide; panicle slender, 5-12 cm, with several alternate racemes often 1 cm apart; racemes erect or ascending, blunt, 1-2 cm; spikelets crowded and subsessile in 4 longitudinal rows, 2.5-3 mm, often obovoid, awnless; second glume and sterile lemma uniformly pubescent, the hairs under 0.5 mm; fertile lemma 2.5-2.9 mm, obtuse or acute; 2n=54. Native to the Old World tropics, now a pantrop. 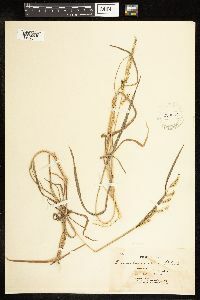 weed, extending n. to Va., Mo., Ill., and Calif.